Bread - 'the staff of life'. The majority of us eat bread at least once a day. For many twice, however, do you know what goes into your daily loaf? If you buy sliced bread, can you even pronounce the ingredients on the packaging? If you cannot - why are you putting it in your mouth? Real Bread contains just four ingredients, Yeast, Flour, Salt and Water. 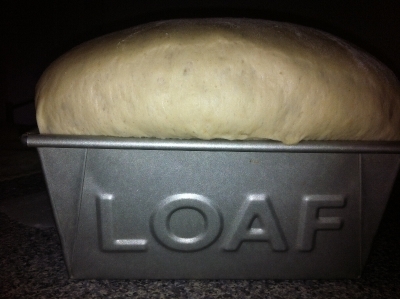 Let Dough at home help you experience how much better it feels to produce your own loaf. You will learn how to hand make your own dough, rest, prove shape and bake before the final test - Eat. 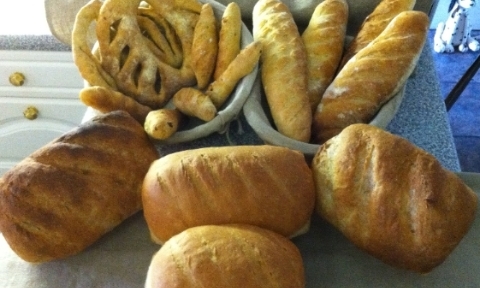 Just imagine the smell of fresh bread emanating through your house. The crunch of a fresh crust and whats more you made it!. Baking is back in fashion, but for us its not fashion but Passion. We believe you should know what you eat, and what feeds your family. It all starts from that humble loaf. From there you can progress to Pizzas, Croissants Focaccia and Fougasse, The basic process is the same just the ingredients change. All at the fraction of the cost of buying it in a shop or restaurant, so much so you could recoup the cost of your lesson in less than 3 months! Here at Dough at home we want to pass on that Passion to you. Your Home, your kitchen, is the location. Saving you the stress of driving to a school, getting there on time, parking and walking from your car . We can come to you at a time that suits you or if you prefer we can do the lesson at our home. We even do weekends. The training is one to one and lasts about 3-4 hours, Depending on kitchen size we can work with 2,3 or 4, it could be a craft day with friends. We'll bring our own utensils and the basic ingredients. If you have a food processor, we'll show you how to best use it to make dough. But don't worry all you really need is a pair of hands. During the lesson we'll talk about different ways to use your new found skills and we'll discuss what books you may wish to buy to experiment further when we're gone.